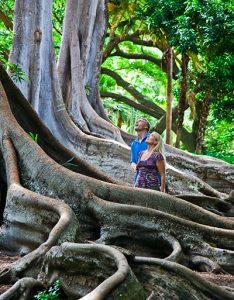 Visit Kaua'i, Hawai'i, the Garden Island. 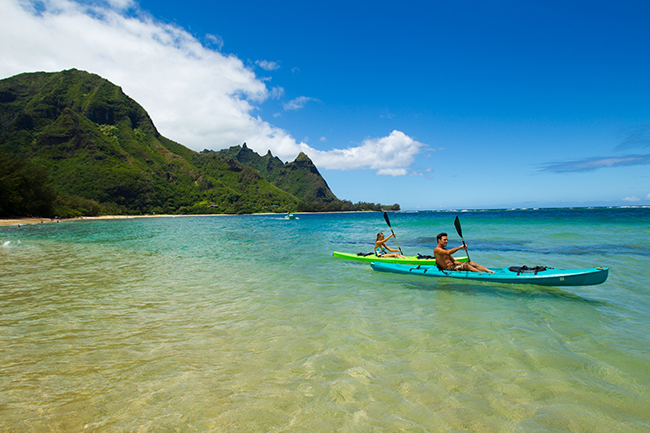 For splendor beyond your vacation resort, visit Kaua’i – Hawai’i’s Island of Discovery™. Here the beautiful seasons of spring and summer stretch further, and the temperature remains pleasant. Soak up the sun at the beach or experience the lush forest covering the mountainous landscape. There are plenty of activities if you wish to surround yourself with all that Kaua’i has to offer: Explore the regional cuisine, enjoy a guided tour of a native botanical garden, or spend time at a golf course. If you have adventure in mind you can zipline through the forest, go horseback riding, kayaking, rafting, mountain tubing, take a helicopter tour, scuba dive or go sailing. With so much to do, you can relax by a beautiful sunset at the end of the day, perhaps at a quiet beach, or to the rhythm of the hula dance. Some of your best memories from Kaua’i will be your culinary experience. Kaua’i has many world-class restaurants, and it’s hard to know where to begin. A new restaurant, by award winning chef Roy Yamaguchi, Eating House 1849, offers menus by local cultures including Hawaiian, Japanese, Korean, Filipino, and Portuguese, in both modern haute cuisine as well as plantation era inspired recipes. If you wish to immerse yourself in Hawaiian culture and enjoy traditional eateries, you can take the Royal Coconut Coast Kaua’i Food Tour. 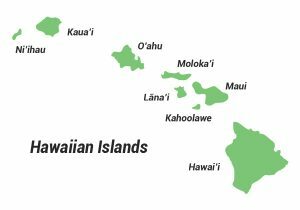 The tour begins with a stroll down to an old plantation where you sample traditional Hawaiian food while learning about the local history, culture and traditions, and it ends with Hawaiian street food at some of the best farm-to-table restaurants on this lush island. 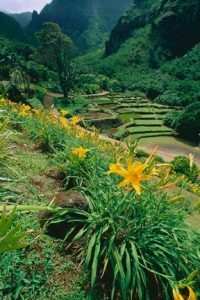 You could also explore the abundant tropical landscape with a visit to one of the island’s botanical gardens – the 17 acre Limahuli Garden and Preserve on the north shore, to find out why Kaua’i is nicknamed the garden island. For vacationing families, they also offer shorter tours geared towards children. Whether you wish to roam freely in the tropical rain forest to admire the many breathtaking waterfalls, or you’d like a panoramic view of the Waimea canyon, Kaua’i offers some of the most popular hikes in all of Hawai’i. Did you know all three Jurassic Park Movies & Jurassic World were filmed on Kaua’i? If you have a vivid imagination, you can venture into the mountains looking for dinosaur trails. When visiting Kaua’i, be sure to visit the Kaua’i Visitors Bureau. They have an abundance of insightful tips to make your vacation go as you’ve planned, or even better. It’s a good idea to check your dates with Kaua’i Festivals & Events to see what special occasions might coincide with your trip. Also, book your Kaua’i vacation with a travel agent specializing in Hawai’i. Someone used to booking Hawaiian travel is familiar with all the considerations and perks that can mean a world of difference for your vacation. Kaua’i might just be the once in a lifetime experience you are bound to repeat.